A churning nuclear fireball, appearing out of nowhere, bringing utter destruction - and countless numbers of them were menacing planets throughout the Galaxy! "Storm" Cloud, nucleonic genius, set out in his spaceship Vortex Blaster to track and destroy the mysterious vortices - and embarked on a saga of adventure, discovery and conflict among the far stars that could have been told only by the incomparable "Doc" Smith. Copyright 1960 Edward E. "Doc" Smith, PhD. —“Storm” Cloud, the only man who could destroy the ravening nuclear vortices that struck and killed at random. was also the name of Cloud’s space-ship, an incredibly advanced arsenal of modern science, in which Cloud and his crew of colorful space castaways hunted the source of the lethal vortices, battled a criminal mastermind, developed unheard-of sciences, and made an ultimate discovery of shattering importance to the destiny of the Universe! team up in a saga of crisis and adventure in the worlds of the Lensmen—“Doc” Smith’s most enduring creation. For his guardian against lightning had been a vortex-magnet at the moment when some luckless wight had tried to abate the nuisance of a “loose” atomic vortex. That wight dies, of course—they almost always did—and the vortex, instead of being destroyed, was simply broken up into a number of widely-scattered new vortices. And one of those bits of furious, uncontrolled energy, resembling a handful of substance torn from the depths of a sun, darted toward and shot downward to earth through Neal Cloud’s new house. That house did not burn; it exploded. Nothing of it, in it, or near it stood a chance, for in a few seconds the place where it had been was a crater of seething, boiling lava—a crater which filled the atmosphere with poisonous vapors; which flooded all nearby space with lethal radiations. Even to that individual grain of sand called “Earth”—or, in modern parlance, “Sol Three,” or “Tellus of Sol,” or simply “Tellus”—the affair was negligible. One man had died; but, in dying, he had added one more page to the thick bulk of negative results already on file. That Mrs. Cloud and her children had perished was merely unfortunate. The vortex itself was not yet a real threat to Tellus. It was a “new” one, and thus it would be a long time before it would become other than a local menace. But to Neal Cloud the accident was ultimate catastrophe. His personal universe had crashed in ruins; what was left was not worth picking up. He and Jo had been married for more than fifteen years and the bonds between them had grown stronger, deeper, truer with every passing day. And the kids . . . it couldn’t have happened . . . fate COULDN’T do this to him . . . but it had . . . it could. Gone . . . gone . . . GONE! His eyes focused vaguely upon the portrait. Wavy brown hair . . . clear, honest gray eyes . . . lines of character, of strength and of humor . . . sweetly curved lips, ready to smile or to kiss. . . . He wrenched his attention away and scribbled briefly upon a sheet of paper. Then, getting up stiffly, he took the portrait and moved woodenly across the room to a furnace. After the flaming arc had done its work he turned and handed the paper to a tall man, with a Lens glowing upon his wrist, who had been watching him with quiet, understanding eyes. Significant enough, to the initiate, of the importance of the laboratory is the fact that it was headed by a Lensman. The Lensman took the document, glanced at it, and slowly, meticulously, tore it into sixteen equal pieces. “Maybe.” Cloud left the laboratory and took an elevator down to the garage. Into his big blue DeKhotinsky Special and away. Through traffic so heavy that front-, rear-, and side-bumpers almost touched he drove with his wonted cool skill; even though he did not know, consciously, that the other cars were there. He slowed, turned, stopped, “shoveled on the coal,” all correctly—and all purely automatically. He did not know where he was going, nor care. His numbed brain was simply trying to run away from its own bitter imaginings—which, if he had thought at all, he would have known hopeless of accomplishment. But he did not think. He simply acted; dumbly, miserably. Into a one-way skyway he rocketed; along it over the suburbs and into the trans-continental super-highway. Edging inward, lane after lane, he reached the “unlimited” way—unlimited, that is, except for being limited to cars of not less than seven hundred horsepower, in perfect mechanical condition, driven by registered, tested drivers at not less than one hundred twenty five miles per hour—flashed his number at the control station, and shoved his right foot down to the floor. Everyone knows that an ordinary DeKhotinsky Sporter will do a hundred and forty honestly-measured miles in one honestly-timed hour; but very few drivers have ever found out how fast one of those brutal big souped-up Specials can wheel. Most people simply haven’t got what it takes to open one up. “Storm” Cloud found out that day. He held that six-thousand-pound Juggernaut onto the road, wide open, for mile after mile after mile. But it didn’t help. Drive as he would, he could not out-run that which rode with him. Beside him and within him and behind him; for Jo was there. Jo and the kids, but mostly Jo. It was Jo’s car as much as it was his. “Babe, the big blue ox,” was her pet name for it; because, like Paul Bunyan’s fabulous beast, it was pretty nearly six feet between the eyes. Jo was in the seat beside him. Every dear, every sweet, every luscious, lovely memory of her was there . . . and behind him, just beyond eye-corner visibility, were the three kids. And a whole lifetime of this loomed ahead—a vista of emptiness more vacuous by far than the emptiest reaches of inter-galactic space. Damnation! he couldn’t stand much more of. . . .
High over the roadway, far ahead, a brilliant octagon flared red. That meant “STOP!” in any language. Cloud eased up on the accelerator; eased down on the brake-pedal; took his place in the line of almost-stalled traffic. There was a barrier and a trimly-uniformed policeman. He turned the Special around. A loose vortex—new. There might be three or four of them, scattered over that many counties. Sisters of the one that had murdered his family—spawn of that damned Number Eleven that that bungling nitwit had tried to blow out. . . . Into his mind there leaped a picture, wire-sharp, of Number Eleven as he had last seen it, and simultaneously an idea hit him like the blow of a fist. He thought. Really thought, now; intensely and clearly. If he could do it—could actually blow out the atomic flame of an atomic vortex . . . not exactly revenge, but . . . it would work . . . it would have to work—he’d make it work! And grimly, quietly, but alive now in every fiber, he drove back to the city almost as fast as he had come away. If Philip Strong was surprised at Cloud’s sudden reappearance in the laboratory he did not show it. Nor did he offer any comment as his erstwhile assistant went to various lockers and cupboards, assembling coils, tubes, armor, and other paraphernalia. “No.” The Lensman tore up the check just as he had torn up the resignation. “If you want the stuff for legitimate purposes, you’re on Patrol business and it’s the Patrol’s risk. But if you’re thinking of trying to snuff a vortex, the stuff stays here. That’s out, Storm. “Humph! I said a usable formula!” the Lensman snorted. “What good is a ten-second forecast when it takes a GOMEAC twice that long to solve. . . . Oh!” he broke off, staring. “Certainly. Don’t interrupt so. I stick around until the sigma curve, extrapolated to zero time, matches one of my bombs. I build up the right velocity, cut that bomb loose, shoot myself off in a sharp curve, and Z-W-E-E-T—POWIE! She’s out.” With an expressive, sweeping gesture. “I’ll be there,” and again Neal Cloud and Babe, the big blue ox, hit the road; and as he rolled along the physicist mulled over in his mind the assignment to which he had set himself. Like fire, only worse, atomic energy was a good servant, but a very bad master. Man had liberated it before he could really control it. In fact, control was not yet, and probably never would be, perfect. True, all except a minute fraction of one percent of the multitudes of small, tame, self-limiting vortices were perfect servants. But at long intervals, for some unknown reason—science knew so little, fundamentally, of nuclear reactions—one of them flared, nova-like, into a huge, wild, self-sustaining monster. It ceased being a servant, then, and became a master. Such flare-ups occurred very infrequently; the trouble was that the loose vortices were so utterly, so damnably permanent. They never went out; and no data were ever obtained. Every living thing in the vicinity of a flare-up died; every instrument and every other solid thing within a radius of hundreds of feet melted down into the reeking, boiling slag of its crater. Fortunately, the rate of growth was slow—as slow, almost, as it was persistent. But even so, unless something could be done about loose vortices before too many years, the situation would become extremely serious. That was why the Laboratory had been established in the first place. Nothing much had been accomplished so far. Tractor beams would not hold. Nothing material was of any use. Pressors worked after a fashion—vortices could be moved from one place to another. One or two, through sheer luck, had been blown out by heavy charges of duodecaplylatomate. But duodec had taken many lives; and since it scattered a vortex as often as it fed it, duodec had caused vastly more damage than it had cured. No end of fantastic schemes had been proposed, of course; of varying degrees of fantasy. Some of them sounded almost practical. Some of them had been tried; some were still being tried. Some, such as the perennially-appearing one of installing a free drive and flinging the whole neighborhood off into space, were perhaps feasible from an engineering standpoint. They were potentially so capable of making things worse, however, that they could not be used except as last-ditch measures. In short, the control of loose atomic vortices was very much an unsolved problem. NUMBER ONE, the oldest and worst vortex on Tellus, had been pushed out into the badlands, and there, at eight o’clock of the indicated morning, Cloud started to work on it. The “lookout shack” was in fact a fully-equipped nucleonics laboratory. Its staff was not large—eight men worked in three staggered eight-hour shifts—but the development of its instrumentation had required hundreds of man-years of intensive research. Every factor of the vortex’s activity was measured and recorded continuously, throughout every minute of every day of every year; and all of these measurements were summed up, integrated, into the “sigma” curve. This curve, which to the layman’s eye was only a senselessly zig-zagging line, told the expert everything he wanted to know. Cloud glanced at the chart and scowled, for one jagged peak, less than half an hour old, almost touched the top line of the paper. “No equation, I suppose,” Strong said. The Lensman ignored as completely as did the observer, if not as flippantly, the distinct possibility that at any moment the observatory and all that it contained might be resolved into their sub-atomic components. The Lensman and one of the observers helped him into his cumbersome, heavily-padded armor; then all three men went out to the flitter. A tiny speedster, really; a slim torpedo with the stubby wings and the ludicrous tail-surfaces, the multifarious driving-, braking-, side-, top-, and under-jets so characteristic of the tricky, cranky, but ultra-maneuverable breed. Cloud checked the newly installed triplex launcher, made sure that he knew which bomb was in each tube, and climbed into the tiny operating compartment. The massive door—flitters are too small to have airlocks—rammed shut upon its teflon gaskets, the heavy toggles drove home. A heavily-padded form closed in upon the pilot, leaving only his left arm and his right leg free to move. Cloud shot the flitter into the air and toward the seething inferno which was Loose Atomic Vortex Number One. The crater was a ragged, jagged hole perhaps two miles from lip to lip and a quarter of a mile in depth. The floor, being largely molten, was almost level except for a depression at the center, where the actual vortex lay. The walls of the pit were steeply, unstably irregular, varying in pitch and shape with the refractoriness of the strata composing them. Now a section would glare into an unbearably blinding white, puffing away in sparkling vapor. Again, cooled by an inrushing blast of air, it would subside into an angry scarlet, its surface crawling in a sluggish flow of lava. Occasionally a part of the wall might even go black, into pockmarked scoriae or brilliant planes of obsidian. For always, at some point or other, there was a torrent of air rushing into that crater. It rushed in as ordinary air. It came out, however, in a ragingly uprushing pillar, as—as something else. No one knows exactly what a vortex does to air. Or, rather, the composition of the effluent gases varies as frequently and as unpredictably as does the activity of the vortex. Thus, the atmosphere emitted from a vortex-crater may be corrosive, it may be poisonous, it may be merely different; but it is no longer the air which we human beings are used to breathing. This conversion and corruption of Earth’s atmosphere, if it could not be stopped, would end the possibility of life upon the planet’s surface long before the world itself could be consumed. As to the vortex itself . . . it is difficult indeed to describe such a phenomenon. Practically all of its frightful radiation lies in those octaves of the spectrum which are invisible to the human eye. Suffice it to say, then, that it was a continuously active atomic reactor, with an effective surface temperature of approximately twenty five thousand degrees Kelvin, and let it go at that. Neal Cloud, driving his flitter through that murky, radiation-riddled atmosphere, extrapolating his sigma curve by the sheer power of his mathematical-prodigy’s mind, sat appalled. For the activity level was, and even in its lowest dips remained, well above the figure he had chosen. Distant though he was from the rim of that hellish pit, his skin began to prickle and to burn. His eyes began to smart and to ache. He knew what those symptoms meant: even the flitter’s powerful screens were leaking; even his suit-screens and his special goggles were not stopping the stuff. But he wouldn’t quit yet: the activity might—probably would—take a nose-dive any second now. If it did, he’d have to be ready. On the other hand, it might blow up any second, too. There were two schools of mathematical thought upon that point. One held that a vortex, without any essential change in its nature or behavior, would keep on growing bigger until, uniting with the other vortices of the planet, it had converted all the mass of the world into energy. The second school, of which the forementioned “Calamity” Carlowitz was the loudest voice, taught that at a certain stage of development the internal energy of the vortex would become so great that generation-radiation equilibrium could not be maintained. This would of course result in an explosion, the nature and consequences of which this Carlowitz was wont to dwell upon in ghoulishly mathematical glee. Neither school could prove its point, however—or, rather, each school proved its point with eminently plausible mathematics—and each hated and derided the other, with heat and at length. Neal Cloud, as he studied through his almost opaque defenses that indescribably ravening fireball, that rapacious monstrosity which might very well have come from the very center of the hottest hell of mythology, felt strangely inclined to agree with Carlowitz. It didn’t seem possible that it could get any worse without exploding. The activity stayed high; ’way too high. The tiny control room grew hotter and hotter. His skin burned more and his eyes ached worse. He touched a stud and spoke. Cloud landed. He stripped to the skin and his friends smeared him with the thick, gooey stuff that was not only added protection against radiation, but also a sovereign remedy for new burns. He exchanged his goggles for a heavier, darker pair. The two bombs arrived and were substituted for two of the original load. Again in air, Cloud found that the activity, while still very high, was not too high for his heaviest bomb, but that it was fluctuating too rapidly. He could not get even five seconds of trustworthy prediction, to say nothing of ten. So he waited, as close to the horrible center of disintegration as he dared. The flitter hung poised in air, motionless, upon softly hissing under-jets. Cloud knew to a fraction his height above the ground. He knew to a fraction his distance from the vortex. He knew the density of the atmosphere and the velocity and direction of the wind. Hence, since he could also read, closely enough, the momentary variations in the cyclonic storms within the crater, he could compute very easily the course and velocity necessary to land the bomb in the exact center of the vortex at any given instant of time. The hard part—the thing that no one had as yet succeeded in doing—was to predict, for a time far enough ahead to be of any use, a usably close approximation to the vortex’s quantitative activity. Therefore Cloud concentrated upon the dials and gauges in front of him; concentrated with every fiber of his being and with every cell of his brain. Suddenly, almost imperceptably, the sigma curve gave signs of flattening out. Cloud’s mind pounced. Simultaneous differential equations; nine of them. A quadruple integration in four dimensions. No matter—Cloud did not solve problems laboriously, one operation at a time. Without knowing how he had arrived at it, he knew the answer; just as the Posenian or the Rigellian can perceive every separate component particle of an opaque, three-dimensional solid, but without being able to explain to any Tellurian how his sense of perception works. It just is, that’s all. By virtue of whatever sense or ability it is which makes a mathematical prodigy what he is, Cloud knew that in exactly seven and three-tenths seconds from that observed instant the activity of the vortex would match precisely the rating of his heaviest bomb. Another flick of his mental switch and he knew exactly the velocity he would require. His hand swept over the studs, his right foot tramped down hard upon the firing pedal; and, even as the quivering flitter rammed forward under five Tellurian gravities of acceleration, he knew to the thousandth of a second how long he would have to hold that acceleration to attain that velocity. While not really long—in seconds—it was much too long for comfort. It would take him much closer to the vortex than he wanted to be; in fact, it would take him almost to the crater’s rim. But he stuck to the calculated course, and at the precisely correct instant he released his largest bomb and cut his dive. Then, in a continuation of the same motion, his hand slashed down through the beam of light whose cutting would activate the Bergenholm and make the vessel inertialess—safe from any form whatever of physical violence. For an instant nothing happened, and for that instant Cloud sat appalled. Neutralization of inertia took time! Not that he had ever been told that it was instantaneous—he had just assumed so. He had never noticed any time-lapse before, but now it seemed to be taking forever! 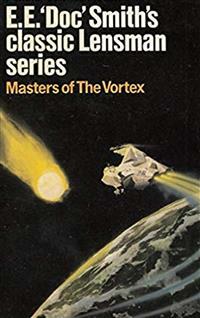 After that one instant of shocked inaction he went into ultra-speed action; kicking in the little vessel’s all-out eight-G drive and whirling her around as only a flitter or a speedster can whirl; only to see in his plate the vortex opening up like a bell-flower, or like a sun going nova. Cloud’s forebodings were more than materialized then, for it was not only the bomb that was going off. The staggeringly immense energy of the vortex was merging with that of the detonating duodec to form an utterly indescribable explosion. In part the flood of incandescent lava in the pit was beaten downward by the sheer, stupendous force of the blow; in part it was hurled abroad in masses, gouts, and streamers. And the raging blast of the explosion’s front seized the fragments and tore and worried them to bits, hurling them still faster along their paths of violence. And air, so densely compressed as to act like a solid, smote the walls of the crater. Those walls crumbled, crushed outward through the hard-packed ground, broke up into jaggedly irregular blocks which hurtled screamingly in all directions. The blast-wave or explosion front buffeted the flyer while she was still partially inert and while Cloud was almost blacked out and physically helpless from the frightful linear and angular accelerations. The impact broke his left arm and his right leg; the only parts of his body not pressure-packed. Then, milliseconds later, the debris began to arrive. Chunks of solid or semi-molten rock slammed against the hull, knocking off wings and control-surfaces. Gobs of viscous slag slapped it liquidly, freezing into and clogging up jets and orifices. The little ship was knocked hither and thither by forces she could no more resist than can a floating leaf resist a cataract; Cloud’s brain was addled as an egg by the vicious concussions which were hitting him so nearly simultaneously from so many different directions. The concussions and the sluggings lightened . . . stopped . . . a vast peace descended, blanket-wise. The flitter was free—was riding effortlessly away on the outermost, most tenuous fringes of the storm! Cloud wanted to faint, then, but he didn’t—quite. With one arm and leg and what few cells of his brain were still in working order, he was still in the fight. It did not even occur to him, until long afterward, that he was not going to make any effort whatever to avoid death. Foggily, he tried to look at the crater. Nine-tenths of his visiplates were dead, but he finally got a view. Good—it was out. He wasn’t surprised—he knew it would be. His next effort was to locate the secondary observatory, where he would have to land; and in that, too, he was successful. He had enough intelligence left to realize that, with practically all of his jets clogged and his wings and tail shot off, he couldn’t land his flitter inert. He’d have to land her free. Neal Cloud was not the world’s best pilot. Nevertheless, by dint of light and somewhat unorthodox use of what few jets he had left, he did land her free. A very good landing, considering—he almost hit the observatory’s field, which was only one mile square—and having landed her, he inerted her. But, as has been intimated, his brain wasn’t working quite so good; he had held his ship inertialess for quite a few seconds longer than he thought, and he did not even think of the terrific buffetings she had taken. As a result of these things, however, her intrinsic velocity did not match, anywhere nearly, that of the ground upon which she lay. Thus, when Cloud cut his Bergenholm, restoring thereby to the flitter the absolute velocity and the inertia she had before going free, there resulted a distinctly anticlimactic crash. There was a last terrific bump as the motionless vessel collided with the equally motionless ground; and “Storm” Cloud, Vortex Blaster, went out like the proverbial light. Help came, of course; on the double. Cloud was unconscious and the flitter’s port could not be opened from the outside, but those were not insuperable obstacles. A plate, already loose, was torn away; the pilot was unclamped and rushed to Base Hospital in the “meat-crate” standing by. Later, in a private office of that hospital, the head of the Vortex Control Laboratory sat and waited—not patiently. “QX. Thanks.” A nurse led the visiting Lensman to Cloud’s bedside. “You’re the most-wanted man in the galaxy, not excepting Kimball Kinnison. Here’s a spool of tape, which you can look at as soon as Lacy will let you have a scanner. It’s only the first one. As soon as any planet finds out that we’ve got a sure-enough-vortex-blower-outer who can really call his shots—and that news gets around mighty fast—it sends in a double-urgent, Class A Prime demand for you. Thus “Storm” Cloud, nucleonicist, became the most narrowly-specialized specialist in the long annals of science; became “Storm” Cloud, the Vortex Blaster. And that night Lensman Philip Strong, instead of sleeping, thought and thought and thought. What could he do—what could anybody do—if Cloud should get himself killed? Somebody would have to do something . . . but who? And what? Could—or could not—another Vortex Blaster be found? Or trained? And next morning, early, he Lensed a thought. TELLURIAN PHARMACEUTICALS, INC., was Civilization’s oldest and most conservative drug house. “Hide-bound” was the term most frequently used, not only by its younger employees, but also by its more progressive competitors. But, corporatively, Tellurian Pharmaceuticals, Inc., did not care. Its board of directors was limited by an iron-clad, if unwritten, law to men of seventy years more; and against the inertia of that ruling body the impetuosity of the younger generation was exactly as efficacious as the dashing of ocean waves against an adamantine cliff—and in very much the same fashion. Ocean waves do in time cut into even the hardest rock; and, every century or two, TPI did take forward step—after a hundred years of testing by others had proved conclusively that the “new” idea conformed in every particular with the exalted standards of the Galactic Medical Association. TPI’s plant upon the planet Deka (Dekanore III, on the charts) filled the valley of Clear Creek and the steep, high hills on its sides, from the mountain spring which was the creek’s source to its confluence with the Spokane River. The valley floor was a riot of color, devoted as it was to the intensive cultivation of medicinal plants. Along both edges of the valley extended row after row of hydroponics sheds. Upon the mountains’ sides there were snake dens, lizard pens, and enclosures for many other species of fauna. Nor was the surface all that was in use. The hills were hollow: honeycombed into hundreds of rooms in which, under precisely controlled environments of temperature, atmosphere, and radiation, were grown hundreds of widely-variant forms of life.